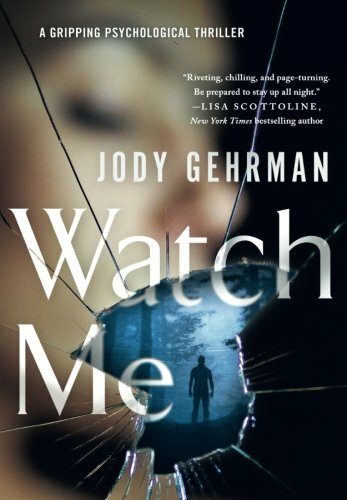 “Watch Me” by Jody Gehrman is one of the more interesting psychological thrillers on stalking and obsession I have read in some time. As a psychologist, I have always been fascinated by stalkers, who are so obsessive they begin their premeditative stalking prior to actually meeting the person they become relentless about. In “Watch Me,” Kate Youngblood is a creative writing professor at Blackwood College and an on-the-side author. She struggles daily dealing with students who lack the talent to become successful authors and are egomaniacs. Sam Gist, a 22 year-old student in Kate’s class, is one of her most promising students. Little does she know that at the age of 17 Sam read her first novel, and he develops a plan to meet her and begin a relationship. Kate is recently divorced, in her mid-thirties, and seems to have hit a plateau in her life that leaves her vulnerable and on a self-pity pot. She finds Sam’s attention riveting and exciting, and at the same time, she knows it is inappropriate to even think about having a relationship with him. I found the opening about Sam to be very catching. Readers can hear his thoughts about Kate as he watches her walk across campus. The author’s vivid description of Sam’s obsession, and his cold, scary thoughts will give you the chance to see Sam for what he is. He is able to mimic just the right behaviors to make one think he is innocent and a part of the average populace. I am also intrigued that stalkers do not often consider what would happen if the person they believe to be perfect, are not. I clearly loved the character Sam with all his cold, creepy behavior and his ability to get rid of anyone or anything that holds Kate’s attention, under the guise of helping her. Kate, I didn’t like so much. She obviously has no clue what a sociopath Sam is, or doesn’t care, as she has such a need for attention. Although she tells herself, she doesn’t require this attention, clearly the author presents her thoughts and behaviors as otherwise. I found her character to be non-decisive on many areas of her life. I have great difficulty relating to people, especially women who let others dictate their actions. It was a fast read, and the author provides great insight into the mind of a stalker. Sam reminds me of a client I had once who informed me that, if I went on my honeymoon he would kill himself. “Watch Me” by Jody Gehrman reminds me of a study on sociopaths and their prey which will have readers researching more on this topic. I highly recommend this psychological thriller to all who love out of the box reads.